While checking out the cool designs at Kick'N'Start at Moto Legende, I got a chance to meet Laurent Bagnard, creater of Powerglide magazine in France. Powerglide spiced up the Hot Rod and Kustom enthusiast's press here while also covering a cross-over interest: music. 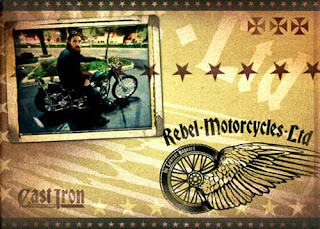 Already the author of one awarding winning book, he's recently released his second work 'Rebel Motorcycles Ltd'. 'Rebel Motorcycles Ltd' is a hardcover, 144-page full-colour photography book. It's a selection of what Laurent Bagnard has been lucky enough to witness around the fast moving world of today's modified bikes, from Europe to Japan through the homeland of stylin' wheels: California! - Photography & layout by Laurent Bagnard. - Forward by Jake Cavaliere (Lords Of Altamont). - Chapter title text only, plus individual bike spec index. - Afterword by Verne Hammond (Burbank Choppers C.C). SIZE: 310mm x 217mm x 15mm.